A study has found that when reindeer reduce the height and abundance of shrubs on the Arctic tundra through grazing, the level of surface albedo - the amount of solar energy reflected by the Earth back into space - is increased. 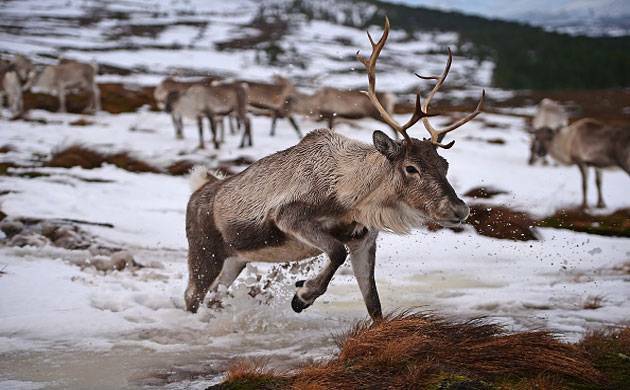 Researchers have found that reindeers, best known for pulling Santa's flying magical sleigh on Christmas Eve, may have a significant part to play in slowing down climate change. "Our theory was that heavy grazing by reindeer increases summer albedo, through a reduction in shrub height, abundance and leaf area index (LAI)," said Mariska te Beest, from Umea University in Sweden. "The effect reindeer grazing can have on albedo and energy balances is potentially large enough to be regionally important," said te Beest. "It also points towards herbivore management being a possible tool to combat future warming. Most of the arctic tundra is grazed by either domesticated or wild reindeer, so this is an important finding," she said. "Of course, the impact the reindeer have will vary according to their densities and the subsequent effects on the vegetation levels across the whole tundra," she added. The study combined land surface computer modelling with measurements of albedo and vegetation characteristics taken in the field. The team carried out their field measurements in an area in Norway with four topographically-defined vegetation types that varied in shrub height and abundance. They used a unique experimental set-up, where a more-than 50 year-old fence separated areas experiencing either light or heavy grazing by reindeer. Working through the summer season, the team estimated reindeer activity in the study areas by using vegetation trampling indicators, and through collecting dung. They also measured the abundance of vegetation, its leaf area index, and the soil moisture and temperature levels, as well as the albedo levels. "We found that high densities of reindeer changed arctic tundra vegetation by decreasing shrub abundance. This resulted in corresponding shifts in LAI, canopy height and NDVI - the amount of live green vegetation," said te Beest. "These pronounced changes in vegetation led in a substantial increase in albedo across the growing season. Our modelling results showed this increase in albedo would result in a corresponding decrease in net radiation and latent and sensible heat fluxes - indicating that heavily grazed sites absorbed less radiation," she said. "Our results show that reindeer have a potential cooling effect on climate, by changing the summer albedo. Although the estimated differences might appear small, they are large enough to have consequences for the regional energy balance," te Beest said. The study was published in the journal Environmental Research Letters.